Traveling from Eagle Harbor towards Copper Harbor, along route 26, you'll see a sign on the right for Brockaway Mountain Drive which as the name suggests takes you to the top of Brockaway Mountain. 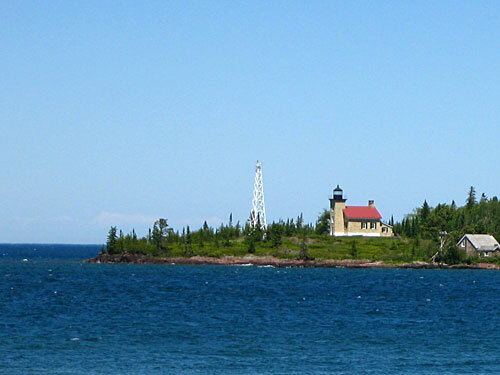 It is an alternate route to Copper Harbor. The drive to the top will give your transmission and brakes a workout, but the the views are worth it. 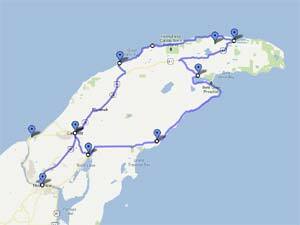 At the bottom of the page is a Google Map showing our recommended Keweenaw Scenic Drive. Continuing on Highway 26 will keep you along the lakeshore for a while until you arrive at Copper Harbor. If you take this route and you spend some time in Copper Harbor, you can always backtrack up Brockaway Mountain Drive to see the views. When you leave Copper Harbor take US Highway 41 south. If it is the fall, you'll find some of the best color along US 41 south of Copper Harbor. 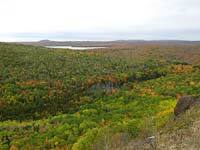 While some continue on US 41 towards Calumet, to get the complete tour of the Keweenaw, you need to exit US 41 12 miles south of Copper Harbor, near the Delaware Copper Mine, to take Lac La Belle Road south. 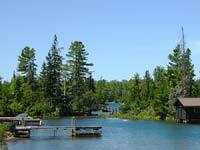 It wraps around Lake La Belle and rejoins Lake Superior on the eastern side of the Peninsula. You along the lake shore drive to the town of Gay. From there you turn inland on the Lake Linden road to the north end of Lake Linden. In the town of Lake Linden you can proceed south towards Hancock or go north to Calumet. We recommend the latter, especially if you haven't had a chance to explore Calumet on your way up. 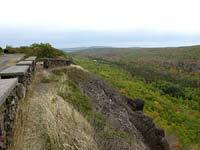 Even on a cloudy day the views from the top of Brockway Mountain are impressive. In the spring, from March 15 to June 15, Brockway Mountain is home base for the Brockway Mountain Hawk Watch where professional hawk counters catalog the passing migration of 16 species of raptors for the national data base of the Hawk Migration Association of North America. 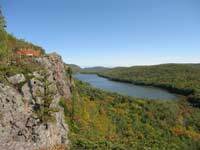 You can see some great photos on the Brockway Mountain Watch Website, like the one shown here to the right. The village of Copper Harbor is Michigan's most northern town. About a mile north of town is the beginning of US Highway 41 which runs from here all the way to Miami Florida. Copper Harbor and things to see and do. 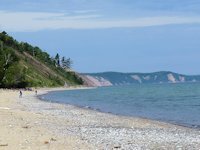 The western shoreline of the Keweenaw from Eagle River to Copper Harbor is the most popular side of the Keweenaw with more tourism attractions. If you want to experience the "other side" go south of Copper Harbor on US 41 until the intersection with Gay Lac La Belle Road near the Delaware Mine. Go south to Lac Le Belle and Bete Grise. On the way you go by Mount Bohemia - an advanced to expert downhill ski area that deserves the title "extreme." The stretch of highway from Point Isabelle to the town of Gay runs along the lakeshore. You are not likely to have much competition along this stretch - just you and nature. Here we stopped at wayside south of Point Isabelle. < < < While many of the beaches along the western shore have lots of lots of rocks, sometimes exclusively rocks, beaches along the eastern shore of the Keweenaw are all sand dunes like this rest stop at Brunnette Park. If not for the cuisine or malted beverages, lots of people like to stop by the Gay Bar to have their picture taken by the sign or just to say they've been to the "Gay Bar." At Gay the road turns inland on the way to the community of Lake Linden. There's a clean municpal campground for tents and RVs at the north end of the lake. From that point, take Michigan 26 north to Calumet and US 41 or alternately go south along Lake Linden to Hancock and across the Portage Lift Bridge to Houghton. Calumet is the center of Keweenaw National Historic Park that captures the mining history that created most of the villages in the Keweenaw. Many impressive brownstone buildings from that era have been preserved in Calumet as well as the buildings that are now part of the National Park. Calumet's Pasty Fest, held annually the last weekend in June is the village's big festival celebrating both its mining history and the culinary "invention" of its Cornish and Finnish ancestory. From Calumet you return to Hancock on US 41 and cross the Aerial Lift bridge into Houghton. Continuing your Lake Superior Circle Tour once in back in Houghton. If you are heading east, take US 41 south heading towards Baraga. 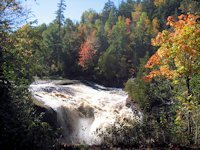 The stretch between Houghton and Baraga is an attractive drive running adjacent to the Keweenaw waterway for a bit, then inland, and then rejoining Lake Superior. In on of our trips, Baraga had the best gasoline price bargains in the UP. If you are heading west towards the Porcupine Mountains, take Highway 26 south towards Twin Lakes. 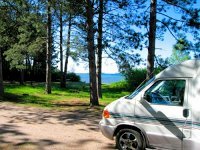 There's a Michigan State Park at Twin Lakes with camping facilities. Nearby is an attractive 9 hole golf course - Wyandotte Hills. 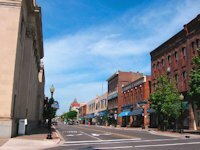 Marquette Michigan, the UP's largest city.